A book-reading event on Monday evening brought Madhu Trehan, a known name in investigative journalism, to the city. Her book Prism Me a Lie Tell Me a Truth: Tehelka as Metaphor, released in January this year, has already made it to the bestseller’s list in non-fiction. She talks about her six-year journey that went in to making of the book. "When I was commissioned by Roli to write the book about Tehelka’s Operation West End, I expected it to be no more than six months’ job. But then, as I interviewed and researched, Tehelka remained to be the skeleton and the book became more about India." Going further, she discussed various aspects of the book: "While exploring Tehelka, I probed why dishonesty is a part of the system in India. Almost every one of us has done sometime, something little. It’s all right to bribe instead of standing in a long queue for a driving license. How we are able to be dishonest without any crisis of conscious and the circumstances that led to it is the query." She mentioned the structure of the book next: "My book is structured on Japanese cult film maker Akira Kurosawa’s Rashomon, in which the story presents four viewpoints and none of them match. Similarly, my book explores the various perspectives, though I clear my stand. But then I also leave it open for the reader to decide for themselves." The third aspect she mentioned is how the government, not able to harm the journalists much, cleverly destroyed the businessmen involved, Shankar Sharma and Devina Mehra, without anyone even noticing it. And the last and most important aspect in her words is: "The aim to show young people how corruption is not the only choice. Dishonest ways can lead to short-term gains but in the long run, they won’t make one happy or successful." Going through her career, a master’s in journalism from Columbia University, she was the one behind India Today, worked in United Nations, started video news magazine Newstrack and launched wahindia.com, she says: "Whatever I did, I did with passion. I started India Today in 1975 with great enthusiasm, then left it to my brother (Aroon Purie) to start a family in New York, and it’s him who has made it the success it is today." Ask her about the Columbia days and she says: "It was a great academic experience. We were exposed to the fundamentals of journalism which I see, here in India, many for no fault of their own never get a chance to." Talking about the most productive period in her journalistic life: "In 1986, when there were many curbs and restrictions, starting Newstrack, a video magazine, was really fulfilling. When people were just used to reading, presenting to them the news visually was a big step forward." She also remembers that period for fearless journalists: "I had really brave journalists with me. I remember Alpana Kishor who interviewed a kidnap victim while still in terrorist’s custody in Kashmir." Busy with her book tour presently, Trehan is looking forward to a much-deserved break: "I have worked 20 hours a day for the book that I enjoyed but don’t really recommend to others. When you work so much, you are bound to make mistakes." And next is the plan to study film making in New York. "I want to write a screenplay. For, I feel to get your message across, films are a quite a ‘janta friendly’ medium. Taare Zameen Par helped so many children and their families where a book may not have reached. But then you never know." A message for our readers: "Read my book," signs off Trehan. In this world of stiff competition and high work demands, we are all losing peace of mind, family ties, personal space and, of course, health. With little or no time left for social interaction or what kids of the 80’s generation were blessed with — daddy, mummy’s precious time, life has become a virtual treadmill for all, where everyone’s running to meet the rising demand and supply curve of cut-throat corporate competition. But waking to the mounting pressure of work and realising the importance of a light head works wonders for work, some of the companies have found a way out with employee-oriented, fun and health management programmes. We check out what’s happening on the corporate front. At Fortis, Mohali, they not only take care of their patients but their employees too. Says Dr Ashish Banerji, director, Fortis Hospital, Mohali; “Every single Monday, we have a meeting of all employees, where we have varied activities for the employees that include games, dance, singing and lot more. Other than this, to keep the talent alive in all of us, we have a competition called Fortis Idol, wherein all employees can participate and the winner competes with employees from across the country.” Hmm…that sounds something like apna Indian Idol! Now we can say, in some companies work and play sure goes hand in hand. Still better, as we surely know, there are many who are just driven by work. It is a ‘low’ that a youngster in Indian cities think is cool. Sagging pants are a hit with youths who see it as a way to flaunt their colourful boxer shorts, designer underwear and even skin - never mind the frowns from the conservative lot. Ask, Nitin Handa, 25, who loves to wear his jeans below the navel so that he can show off his underwear. “When people can flaunt their international bags or shoes with elan, what’s wrong in showing off the logo of your branded underwear? Gone are the days when people used to be casual about their briefs!” Handa said. Harshit Goyal, a college student, said: “Whenever I walk on the road with these droopy pants, I know that I am getting attention from everyone. I look very cool and different. I don’t care what is the latest fashion, I prefer to follow my own style and make my own style statement,” he added. American history reveals there was a close connection between sagging pants and prisoners in jail. The prisoners were not allowed to wear belts because the accessory was a means for jailbirds to hang themselves or use it as a weapon. The absence of the belt thus led to low waist pants. Today, the fashion of sagging pants is associated with hip-hop artists who are hot favourites among people in the 16-25 age bracket. “I am a big hip-hop fan and wearing sagging pants is my way of imitating them and showing that I am a music lover,” admits Goyal. But in India, most parts of which remain conservative even today, sagging pants are often frowned upon as indecent. Can they lead to a clash between freedom of expression and the law against obscenity? “As far as briefs are concerned, there is nothing objectionable about them unless and until they cross-objectionable lines,” senior advocate and former law minister Shanti Bhushan said. Lawyer Abhratosh Majumdar echoed his view. “As far as the issue of sagging pants is concerned, unless it is glaringly indecent as per the set norms in India, any restriction on one’s choice of attire must be held as unconstitutional,” he said on phone. So, then what is ‘indecent’ in terms of the law? “The concept of ‘decency’ changes with time. What was indecent a few decades ago, may not be that bad now. Once the sleeveless blouse was considered indecent. Now it is not frowned upon,” explained advocate Malini Ghosh. At the same time, she said: “Youngsters may find some of the legal restrictions draconian and dated, but in the name of freedom of expression, we cannot allow acts, gestures and events that will violate the sensibilities of others.” And so the debate rages on. 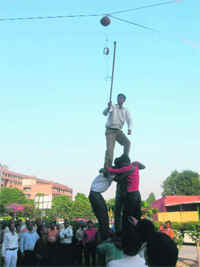 Shobhit Gupta, a college student, said: “I don’t think there is anything indecent about it. We are not revealing our derrière. So the question of indecency doesn’t arise. We have the freedom to wear whatever we want and are exercising our right.” Many parents don’t agree and say such clothes are a source of embarrassment. When a particular plant species allows breeding and evolving of new varieties, it ensures its place in almost every house, garden, park and institute. And it is also due to this fact that you can get different species and varieties. Bougainvillea is one such plant. With an origin in South America, it has made India its second home and first choice with every gardener. Due to the varied nature of different species so far as the growth is concerned, bougainvillea has a wide use. It is suitable for hedging, as climber, for making a globe on the ground, a standard shrub, a pot plant and a miniature, as a bonsai. It is also used as a trailing plant for trellis and pergolas for fast effect. A popular plant with the gardeners it is suitable for planting at places with or without water. Usually it is said that more you neglect a bougainvillea better is the performance. Due to its fast growth, it is used as a good ground cover, especially to hide unsightly places. It is also a favourite with highway planters, who use it to climb dying or dead trees to give colour to the otherwise dull drive. It also fits into the present day lifestyle of society dwellings where it is trained to climb even up to top floors. The spiny plant also finds favour for backyard planting over the back wall as besides protection; it gives plenty of colours demanding a little care. You may also spot plantation along the periphery wall of factories on the highways. With the introduction of innumerable varieties, it keeps garden in colours almost all through the year. What you see as flower is in fact the brilliantly coloured bract surrounding the small insignificant flower. It varies from dazzling white to yellow, peach red to scarlet, orange, crimson to pink, violet and blue. There are bi-colour types too. It is not only the bract colour that gives the plant beauty, but in some varieties, the variegated leaves come as bonus. Do not be surprised if I say, there are varieties that bear different colour bracts on the same plant! This is due to the ageing of a bract over a period of time. Bougainvillea gives mainly two flushes in a year, i.e. November-December and March-April. There are also a few varieties that bloom during summer months. It is therefore very important to make selection knowing about the plant behaviour. The pruning has to be regulated in a way that it leads to good flowering. It is more important in case where bougainvillea has been planted on the central verge of the road. The flowering comes on the current season growth and as a broad principle; one must give at least three months after pruning for bracts to appear. Unmindful of this, the gardeners keep clipping and thus render the plant to be only a green hedge. Generally the gardeners complain that the plants in pots give only vegetative growth and no ‘flowering’. For that dry the pot to the extent that the plant sheds leaves. Then suddenly start giving water. The new growth will be accompanied by flowering. Do not add much of nitrogenous fertilizer. This leads to more of vegetative growth. Vishal Karwal, winner of MTV Splitsvilla Season 1 has found his calling in the world where everything can happen (where rebirth happens on a daily basis), television. And you bet, this boy from Chandigarh loves every bit of the spotlight. “I shot for 13 hours at a stretch. Pretty tiring, but I quiet enjoy it,” says Vishal, whom we would soon see in a daily soap on Colours. In addition to the camera, another thing Vishal seems to be gung ho about is technology. “I am a total tech freak,” he defines. We dig into his tech world surrounded by gadgets and gizmos. I don’t leave home without my Sony 10 mega pixel camera. I am fond of photography, and this cool camera gives excellent results. It is easy to operate and looks cool too. No matter, where I am, the camera is always in tow. Facebook is the best social networking I have come across and exceptionally utilitarian. Thank god that we have something like this; otherwise it would have been nearly impossible to stay connected with friends. Now, I can chat with friends who stay abroad anytime of the day. In a way it has helped us build a small world of friends and like-minded people. All the same, I feel an added feature like video conferencing can make it even more interesting and desirable. This feature will diminish the geographical barrier (if any) between friends and family members. After the camera, this is my second companion. I always have time to check my laptop, upload pictures, check new features and introduce new things that would facilitate in the working and improve the speed. I don’t know how, somehow I always find my I-pod with me. I am a die-hard Rahat Fateh Ali Khan fan and my I-pod is loaded with his songs. I am also in the habit of changing songs pretty regularly. I check various music sites, and I find anything interesting it finds place in my music gadget. Urban cowboy: Fresh take on the young cowboy’s lifestyle set in the comforts of your own urban setting, slim boots dust deposition, over-dyes, flap cut back pockets or dirty distress, the palette has all of them. Cric ‘n’ college: Fresh new colours, soft washes, preppy varsity stripers, badges, cricket club graphics, slub cottons, and all the colours of the teen spirit come alive in this collection. Soft summer colours, washes with fresh blues, twin pocket and stylised college details of this line for sure smells like a teen spirit. The blue label: It manifests itself in an array of the latest denims. Three main denim fabric innovations include: Control OC – The outlast® jeans: Technology originally developed for NASA Certified Space Technology® by Space foundation (an initiative of aerospace industry and NASA), now available to everyone. Outlast® absorbs excess body heat and releases it back to you when you need it most. Rebel – The stainless jeans: Hates stains as much as you do, ketchup, honey, coffee, red wine, or grease list is not endless but can go longer for sure, you can drop them on this pair and all you have to do is rinse it with some water and no stain. To one computer user, just backing up periodically will be sufficient and to another user this is not enough. Those who depend on their data and computer for more than just casual personal computing understand that if a hard drive fails, their business is down until they can get it back up and running again. Home users who store irreplaceable photographs and home video on their computers also fall into this category. A more comprehensive backup plan is recommended to help recover from disasters in a timely fashion. Built-in operating system options Microsoft Windows operating systems provide built-in back up capabilities that allows us to back up our documents or files onto external media. Beginning with Windows XP and its Automated System Recovery feature, each successive Microsoft desktop operating system includes the capability to help recover your entire hard drive if necessary. These backup solutions are reliable and provide a built-in way for us to back up our data without having to buy an additional program to do so. Manual copying onto external devices One can always resort to the old stand-by method of backing up by manually copying your data onto an external hard drive, USB memory stick or other external device such as a recordable CD, DVD or even a floppy drive if you have one. This is bulky, but if one dose not have a lot of files, it may be an acceptable solution. The pitfalls with this method is that if we have multiple files, then we have to make sure we get all of them, and may need numerous target media to save all of our files to. Making an image of your hard drive This is a more comprehensive backup and disaster recovery solution generally performed by technically savvy computer users. This option includes using a programs to make an image of your entire hard drive, which can then be “re-imaged” in case of catastrophic failure to a new hard drive, providing a hard drive disaster recovery plan. Using this solution, within a short period of time, you can be back up and running with ALL of our documents, settings, programs and EVERYTHING intact, as if the disaster never occurred. The way to determine the best solution to fit your needs is to ask yourself how soon you need to be back up and running after encountering a disaster, and how much you are willing to pay. If you cant wait several days, then a computer back up program might be right for you. Or finally, if your business depends upon your computer and its applications and data and you need your data files immediately, and you have a second computer that you can copy them to, then backing up on a external devices solution might be the best way to go. This one’s for those who swear by on line friendship, courtesy the social networking sites. Sharing personal pictures on Facebook, Orkut is the new medium of strengthening the bond. And the happening and eager lot have gone an extra mile and pasted their albums on for the friends to check out, admire and connect. So much so, some have even loaded huge picture galleries for their friends and strangers to check out. Photo sharing is fun, wherein youngsters also share their ‘personal’ pictures like honeymoon couple enjoying a drink on the beach, group of friends freaking about in their night suits to pictures like my pet, my house, my friends, my daadi. “It is makes it convenient for friends to view pictures,” offers Pawan Singh, student of commerce, who has a loaded nearly 500 pictures in his photo gallery. “All a friend has to do is to press slideshow or view it in thumbnails, and enjoy the moments. I kind of showed my entire house and family to my girlfriend in Australia through the photo album.” The only drawback, as per Pawan is that it takes lot of time to upload pictures. But with the help of high-speed broad bands, you can upload pictures and videos as well. No wonder, this makes U-tube popular with youngsters who like share their whacky videos. Not only this, you can also invite people to share your pictures. And the scraps left by your friends are like an icing on the cake. “I make a special effort to get my pictures and then passionately share it with my Orkut friends community,” tells Nancy. “I also use Gmail to share pictures. You will find my entire world on the scrap book,” she adds with a puckish grin. Now, despite the hullabaloo about ‘strengthening friendship’ through pictures, some youngsters fear that sharing pictures is not an exciting idea. They fear that their pictures can be misused. Puts in Pawan, “Not everyone has an access to my picture gallery. It is locked for the strangers. Only friends can see them.” However, Pawan also shares his disgust for people who paste all kinds of weird pictures. An innovative technology start-up in the online solutions in education and virtual meeting space, eAge Software Services Private Limited, has announced the launch of Gurumantra – a virtual classroom coaching that provides any time – anywhere post-class mentoring, as per user requirement. It facilitates a collaborative learning environment for students ranging from Class VI to Class XII in a cost-efficient manner and also provides a unique blend of mix and match of study groups and 1:1 student time with coaches and teachers. Question banks, practice papers and expert advice for parents and students are just some of the services available in this feature rich product. Gurumantra makes studies more interesting and interactive. Tutors make the hardest of things very simple and uncomplicated. Students now do not have to waste time in travelling to various coaching centres. It is extremely user-friendly and the tools like raise hand and whiteboard helps the students interacting with the tutor during the class. eAge is amongst the first Indian companies to build e-solutions for the dissemination of coaching and tuition on the Net. 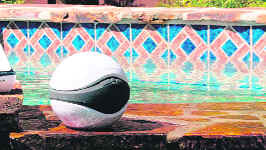 These unique submersible waterproof speakers are specifically designed for the water and feature wireless technology with a 150-foot outside range. They receive the audio signals from an included transmitter that simply plugs into your iPod, MP3 player or any other audio source with a 3.5mm jack. The transmitter itself can support up to 10 additional speakers if you really want to rock out. It’s too bad these speakers aren’t soft though, because then you could play catch with them in the pool too. This wireless wonder can be attached all king. Twitter enthusiasts who spend hours on the trendy social networking could be struck with painful muscle problems, warn experts. Physiotherapists and Repetitive Strain Injury (RSI) sufferers have advised Twitter users to moderate their time on the site - or risk it ruining their health. Twitter’s nature implies users are encouraged to update their activities more frequently than other sites, like Facebook or MySpace. Shoojit Sircar’s film on the life and songs of Kishore Kumar written by Rensil d’Silva might be on hold for now, but that hasn’t stopped Nagesh Kukunoor and Sudhir Mishra from planning their own movies on the legendary actor-singer. Mishra says making a Kishore Kumar biopic would be a “dream come true”. “My favourite filmmaker and one of the primary influences on my life and career is Guru Dutt. However, a film on his life seems difficult if not impossible. Guru Dutt has already borrowed chapters of his own life in Pyasa and Kagaz Ke Phool. Making a Kishore Kumar biopic would be a dream come true. No one knows the real Kishore,” the filmmaker said. But Mishra, known for movies like Khwaishein Aisi and Chameli, is not yet sure who to cast in the lead role. On the other hand, Nagesh Kukunoor, who also plans a film on Kishore Kumar, is sure of his main actor. He wants to cast his favourite actor Shreyas Talpade as Kishore Kumar for two reasons. First, Kukunoor feels a Kishore Kumar biopic cannot be attempted with a star who has a strong image and second, Shreyas is a huge Kishore Kumar fan himself. Kukunoor thrives on Kishore Kumar songs and claims to know the most obscure of them. “And if it’s a duet I only know the male portion by heart,” he chuckled. The Iqbal director wants to focus on the music and songs of Kishore Kumar. His narrative would be propelled forward on the strength of Kishore Kumar’s songs and he is in the process of acquiring the rights to the original numbers. The filmmaker has spent hours with Kishore Kumar’s son Amit Kumar and wife Leena Chandavarkar, who gave Nagesh enough anecdotes to make his biopic comprehensive. Interestingly, Kishore Kumar’s immediate family has also had meetings with Shoojit Sircar, who plans his biopic after he completes his current assignments. Kukunoor has already approached producers. He had reportedly gone to Subhash Ghai with the proposal. Though the producer-director was enthusiastic about the idea, he apparently felt such a mammoth project required an equally big name. One possibility that Mishra is willing to explore is to cast Kishore Kumar’s younger son Sumit...provided Sumit could act. “But then whoever thought Kishore Kumar could act, sing, dance, entertain, compose...all at the same time? His son must have inherited some of that talent,” he reasoned. Theatre is her first love, but petite actress Kalki Koechlin of Dev D fame says she chose to join Bollywood because she realised one can’t survive on theatre alone. “Theatre is my passion but unfortunately in this world you can’t survive doing only theatre. Theatre is an actor’s medium and it sharpens your acting skills, but it doesn’t give you enough money to survive,” Kalki said. “Acting is like yoga for me. It makes me happy; so now I am trying to create a balance between theatre and Bollywood,” she added. She was in the capital to attend designer duo Anjalee and Arjun Kapoor’s bash to celebrate the opening of their stores in New York and Hong Kong. Earlier, the 26-year-old was in the capital to stage the play The Skeleton Woman, which she had scripted herself. It’s based on a Inuit folk tale about a woman and her husband, Women, Who run with the Wolves by Clarissa Pinkola Estes. “I have been working on this play ever since Dev D got over. I knew that I immediately didn’t want to act in another movie; hence I started working on the play,” She said. Kalki, who played Chanda in Dev D - director Anurag Kashyap’s contemporary interpretation of Sarat Chandra Chattopadhyay’s classic Devdas- is still trying to strike a balance between her personal and professional life.“It’s an art to maintain a balance between your professional and personal life because media hounds you 24x7. You can’t completely ignore them because you need good publicity to get good work. But sometimes it becomes erratic when they are after your private life,” she said. While the rest of Bollywood is abuzz with reports of a rift between the industry’s ‘It’ couple Ranbir Kapoor and Deepika Padukone, the actor’s sister Riddhima Kapoor says that the couple are very much in love. “I have met Deepika, and she is a very talented and intelligent girl who has achieved a lot despite her young age. My family likes her. I am happy for my brother because he is happy with her” Riddhima said in an interview. From the time they started dating last year after hooking up on the sets of Bachna Ae Haseenon Ranbir and Deepika have been inseparable and grapevine suggested that the young couple plan to get hitched soon after Rishi Kapoor started referring to Deepika as ‘bahurani’. However, the first signs of trouble came when Ranbir’s growing friendship with Katrina Kaif made headlines and then Neetu Singh dismissed Deepika as ‘just a girlfriend’. But when asked about the reports, Riddhima brushed them off saying that she had not heard any such news about a rift between the two. Bollywood’s most talked about married couple Abhishek Bachchan and Aishwarya Rai Bachchan won’t be in India for their second wedding anniversary on Monday. They have taken off on a week-long holiday to an undisclosed destination. “Last year Abhishek was slogging it out in Miami for Dostana and Aishwarya joined him there for their wedding anniversary. This year they were again supposed to be working, though happily together, for the next schedule of Mani Ratnam’s Raavan on their anniversary,” a source close to the couple said. But Ratnam, who was admitted to a private hospital Wednesday following breathing difficulty and dizziness, has been advised by doctor to rest for a while as a result the the schedule of Raavan” has been slightly pushed ahead giving the pair a chance to go for a much-needed holiday. Shivshakti, the young debutante of TV serial Sabki Laadli Bebo, loves her role as the pampered child as she feels that it is just an extension of her real life. “I wanted to live my real life on screen, and I am doing it. I am more than happy,” said the chirpy young girl, who will turn 16 next month. Shivshakti plays Bebo in the new primetime show launched last month, which revolves around a Punjabi family devoted to their only girl child. The actor claims that her television character is only an extension of her real life situation, with her on screen parents just as caring as the real life ones. Shivshakti says that even in her family, her elder sister was the first female child born after ninety years. Telugu director Raj K.S. Gopi says that Bollywood actor Preeti Jhangiani’s sensuous item number in his directorial debut Tejam will boost her career in southern films. “I’m doing a film with eight newcomers. Preeti is well-known in Telugu but so far she has done mostly offbeat, mellow roles. Now that she is doing an item number, her career will get a boost,” Gopi said. Preeti, however, said she is playing a “vital role in Tejam. “My role is important to the story as is my dance number,” the actor was quoted as saying. While Preeti’s pictures in a skimpy outfit has created a wave in Hyderabad ahead of the movie’s release, sources close to her said that the Mohabbattein girl was looking forward to the image makeover.